Larger volume tire require lesser tire pressure, while smaller volume tire require higher tire pressure. Depending on the types of ride, the volumes of MTB tires varies according to the types of bikes. Generally, the tires of XC bike have smaller volume than trail and AM bikes, while that of DH bike have the largest volumes of tires. Heavier rider require higher pressure. The recommended tire pressures as illustrated above are based on 140 lbs to 150 lbs riders. You may want to vary the tire pressure to suit your weight and ride. Lower tire pressure is more preferred in wet terrain to provide better traction and minimize slipping. Generally, if you are riding an AM bike under wet condition, adjusting the tire pressures to 18 psi for tubeless tire may not be uncommon. My favorite tire pressures for AM bike in wet condition is 18psi for front tire (Nevagal Tubeless 2.35) and 20psi for rear tire (Nevagal Tubeless 2.1). For dry condition,, I prefer 22psi for front tire and 25psi for rear tire. Generally, tubeless tires require lower tire pressures than tube tires. Depending on all of the above factors, pump the tire pressures according to your comfort level. If speed is your priority, go for higher tire pressure but you will sacrifice traction. If the terrains are very rocky, too much pressure may bounce you off your saddle while too low pressure may puncture your tires. Try to experiment the ideal tire pressure that best suit your weight, the riding terrain and the types of ride you want. 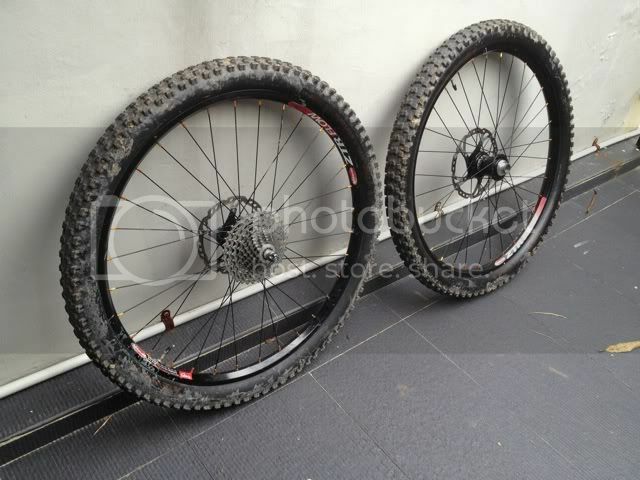 For XC bike, I prefer 35psi for both tires (XR3 2.2 tube tires) in normal trail condition. Actually it can depend on a lot more factors than just rider weight especially for off road. TPI of rubber, number of ply, material and the actual volume. To a certain extent it would also depend on what size of inner tubing is used if not tubeless. Last but not least will be individual riding style. @ ~170lb geared up, on really large volume 2.4 Ardents I run 19/21-22 psi for front/rear... on a smaller WTB XT rear-- the psi is ~ 22-25 for overall. Agree with you Den. It also depends on types of terrain, wet or dry condition. The chart only serve as a guide. Cheers!